I love books, so when I come across a beautiful new cookbook -- so lovely it doubles as a coffee table book -- I'm a happy camper. 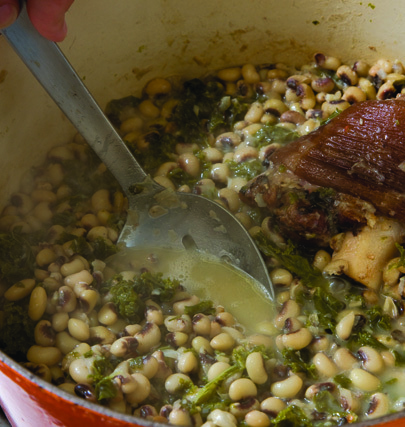 Recently I've been losing myself in Wild Abundance: Ritual, Revelry & Recipes of The South's Finest Hunting Clubs, gazing at the stunning photography of Lisa Buser, drooling over the delectable recipes of the chefs and cooks, and reading the warm tales about the people and places brought together by editor Susan Schadt. Odd as it may seem for a girl who grew up in cities, my family actually did a fair bit of hunting when I was a kid. My father was a chef who loved to hunt, and my family would pile into our camper and drive all the way from California to Montana or Wyoming for weeks-long hunting, fishing and camping trips on horseback. Perhaps because of this, I've always been skeptical of carnivores who shun hunting. I've just never understood why someone who is not a vegetarian could have anything against the hunt. Often when I speak of hunting, people gasp, You'd kill Bambi?! Yet these same people happily order venison in a restaurant and buy it from the market. I truly believe the modern mentality born of experiencing meat all cut up and sold in plastic wrapped packages at the grocery story is the very disconnect that has led to the horrible animal raising and slaughtering practices rampant in today's food industry. To hunt is to respect and appreciate the life of the animal with which you're nourishing yourself, as well as the land on which they nourish themselves. 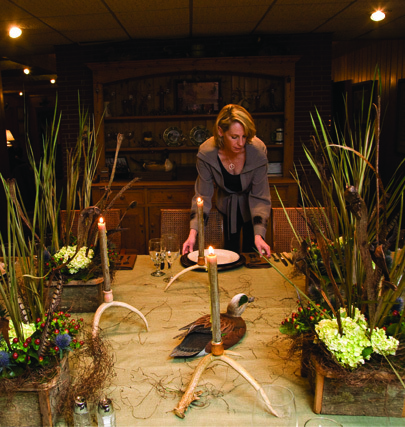 Wild Abundance was conceived by Susan Schadt, President & CEO of ArtsMemphis, who wanted to share the story of the south's best hunting clubs, expanding on the concept of her first book, First Shooting Light: A photographic journey reveals the legacy and lure of hunting clubs in the Mississippi Flyway. "When I was first thinking of the project," said Susan, "I thought to myself, Who better to tell these stories than chefs?" 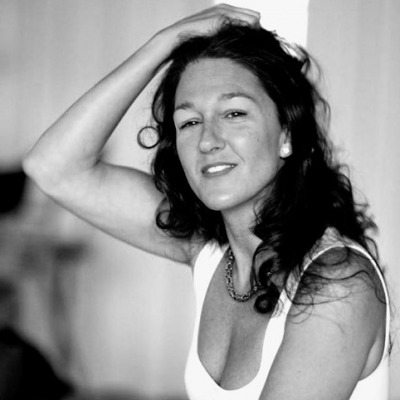 "When I called the first two chefs to tell them my idea, they got it right away. 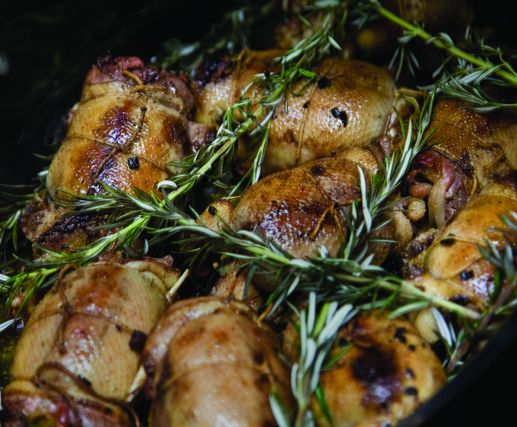 These hunting clubs represent the truest form of local, sustainable food. The 'farm-to-table' movement has been going on in these places for centuries, and hunters and fishers are the biggest conservationists of all." Of the spirit of the book, Susan also told me, "I wanted to pay tribute the unsung heroines and heroes of the kitchen." The resident cooks of the hunting clubs. "At first the cooks were hesitant to have their kitchens invaded by celebrity chefs from the city. But in every case the chefs worked hard to earn the respect of the cooks, and they even learned a thing or two from them." Derek Emerson, Chef/Owner of Walker's Drive-In and Local 463 in Mississippi, one of the chefs in the book, said to me, "I'm just a cook like they are. I'm called a chef, but we're all just cooks at heart." Emerson, a three-time James Beard Award semi-finalist for Best Chef in the South, didn't actually go hunting on his visit to Fighting Bayou hunting club, telling me, "I wanted to get the whole experience of being with the cooks, Rosie Mae Brown and Annie Hogan. They make a big breakfast and dinner for the hunters, and I wanted to be a part of that. At first they were understandably not too open to me. But I respected that it was their kitchen and I was just a visitor. It wasn't long before we were all working together like good old friends." Derek Emerson grew up in Los Angeles, and he'd never been exposed to anything like Fighting Bayou. "It was amazing. The traditions, the history, the people... and their love of the land. They have something they call 'the benediction' and 'giving praise to the ducks.' And there's the 'liar's pit,' a big outdoor fire pit where everyone stands around and tells stories. Seeing all this and being a part of it was like being let into some secret society." 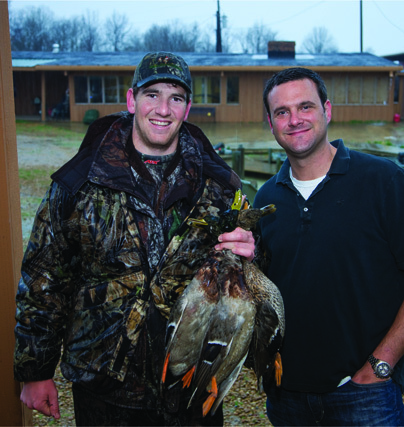 Emerson's visit coincided with one of the many visits by New York Giants quarterback Eli Manning, who has been going to Fighting Bayou since he was a kid. "Eli comes into my restaurants, but seeing him at Fighting Bayou was different. He was so relaxed there, it's like a second home for him. His family is a big part of the place and he comes down here as much as he can." The experience was so special that, said Emerson, "I'm going back to Fighting Bayou this season, and this time, I'm going on the hunt." 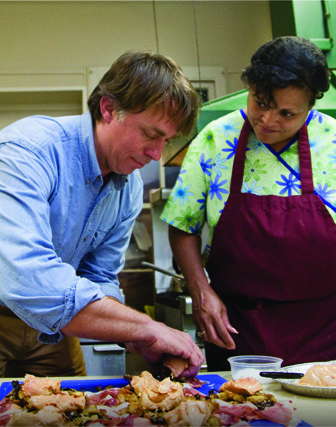 Another chef invited to participate was James Beard Award winner John Besh, Chef/Owner of August in New Orleans, and five other restaurants around Louisiana. 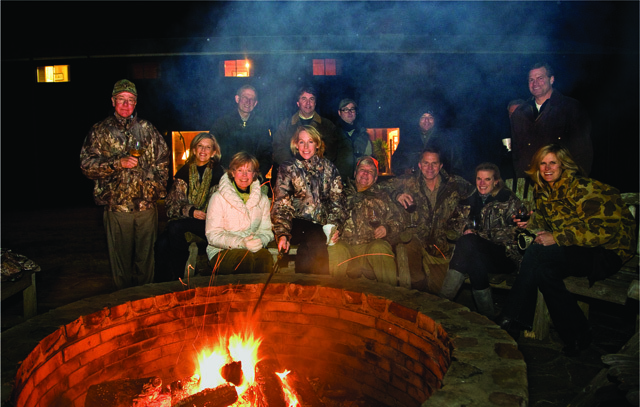 Besh made his way to The Bayou Club to hunt and cook with the people who make the place feel like a home. 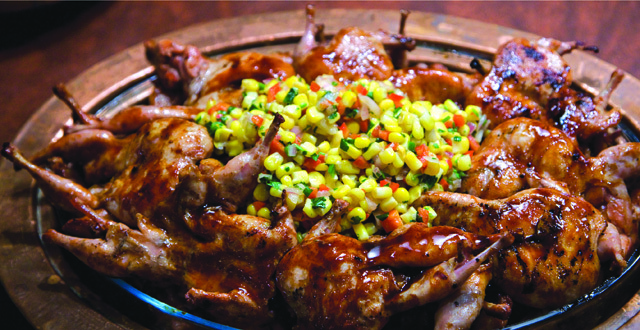 In the book, Besh -- who grew up hunting -- says, "The Bayou Club is much more than just a place to hunt. 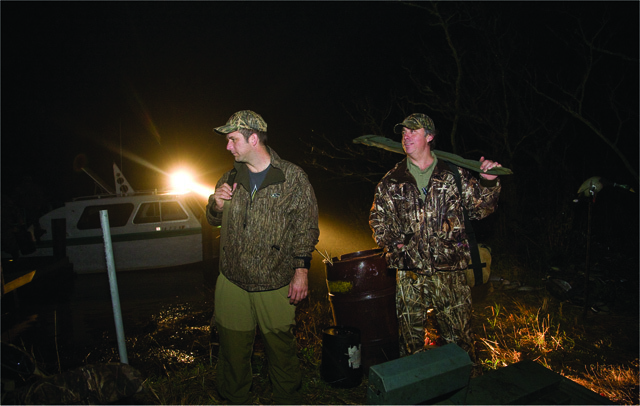 It's about ceremony, tradition, camaraderie, and, of course, the best hunting of south Louisiana." Like his friend Derek Emerson, John Besh also did his best to work his way into the heart of the club cook, in his case Sylvia Herbert Nolan. In the book, Besh writes "I come bearing gifts of crab, oysters, shrimp and wine. That's the way in with a good cook -- food and wine!" Later in the story, he confesses, "I burn the sauce twice, much to the enjoyment of my dear chef Sylvia, who laughs and thinks it humorous that even with a television cooking show, I still burn the sauce." 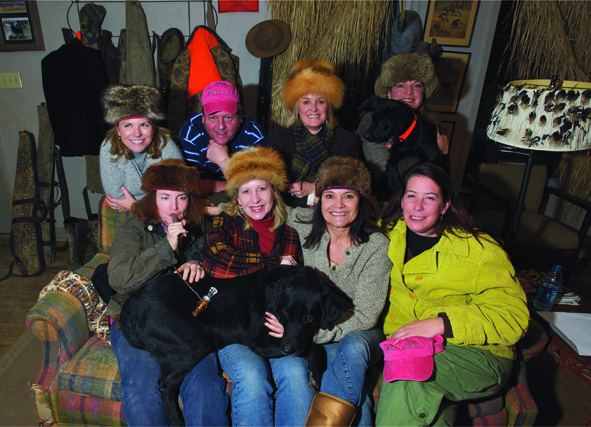 The other seven chefs and hunting clubs in Wild Abundance are Alex Grisanti at Blackfish, Lee Richardson at Circle T, Donald Link at Grand View Lodge, John Currence at Mallard Rest, Kelly English at Menasha, Karen Carrier at Quail Hollow, and Martha Foose at Ward Lake (home of the Swamp Witches). 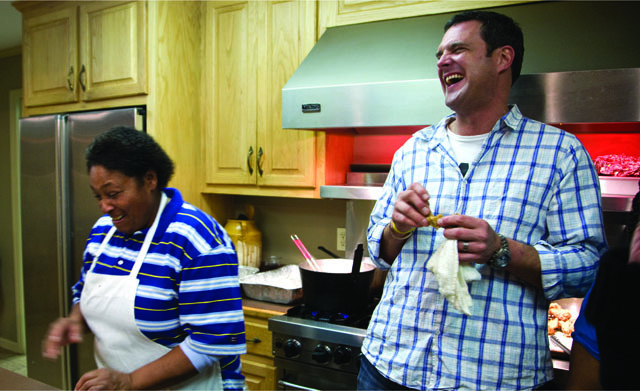 Editor Susan Schadt traveled to every club with each chef. Of the experience, she told me, "It was probably the best thing I've ever been involved with. All the chefs volunteered their time, and there was visible growth in the relationships between the chefs and cooks. There's real emotion on those pages." And so there is. So much emotion in fact, that even during the holidays, when I especially love New York City, Wild Abundance is enough to make this nature-loving, game-craving city girl want to run for the wilds of America, and never look back. 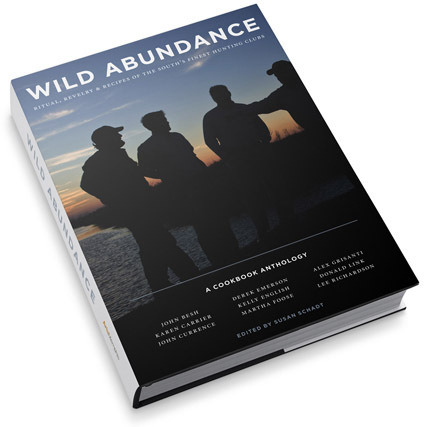 Wild Abundance is available online at Amazon and Barnes & Noble booksellers. All proceeds from the book go to support the programs of ArtsMemphis.